For any law enforcement officer contemplating peacekeeping duties deployment, retired Toronto Police Service (TPS) Inspector Paul Vorvis has some advice. Retired since 2011 after 35 years on the job, Vorvis served two tours in Afghanistan. For a 10 -month period up until August, he was a mentor/adviser to the Afghan National Police (ANP) and the Ministry of the Interior and head of the unit responsible for strategic development and training of ANP officers in all areas related to organizational reform, leadership development and command control functions. From November 2011 to October 2012, he was the head of the field implementation office. Vorvis visited the site of the famous Buddha statues in Bamiyan that were destroyed by the Taliban in 2001. 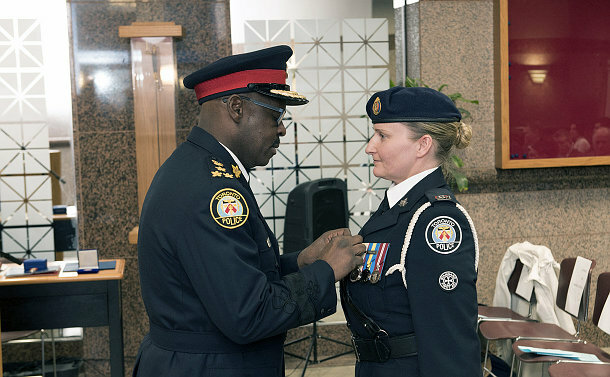 Vorvis was among nine TPS officers – past and present – who were awarded Canadian Peacekeeper Service Medals at the ceremony. Other recipients were D/Sgt. Reginald Pitts who is also retired, Inspector Tim Crone, Sergeants Nicole Bailey and Phillip Sinclair, Detective Jodi Mitchell and Constables Gregory Boltyansky, Marie-Josee Fournier and William Vollmar. Constable Jason Tomlinson, who was attached to the North Atlantic Treaty Organization during his deployment, was presented with the Canadian government Operational Service Medal, while Sergeant Kevin Kaposy, who was attached to the Canadian Training Mission in Ukraine, and Constable Guy Kama, who served in Haiti, were recipients of the Royal Canadian Mounted Police (RCMP) International Peace Operations Commemorative Coin. Staff Sergeant Grant Burningham, who served in Afghanistan from November 2012 to December 2013, was awarded an additional rotation bar to the Operation Service Medal for serving over 390 days in mission. 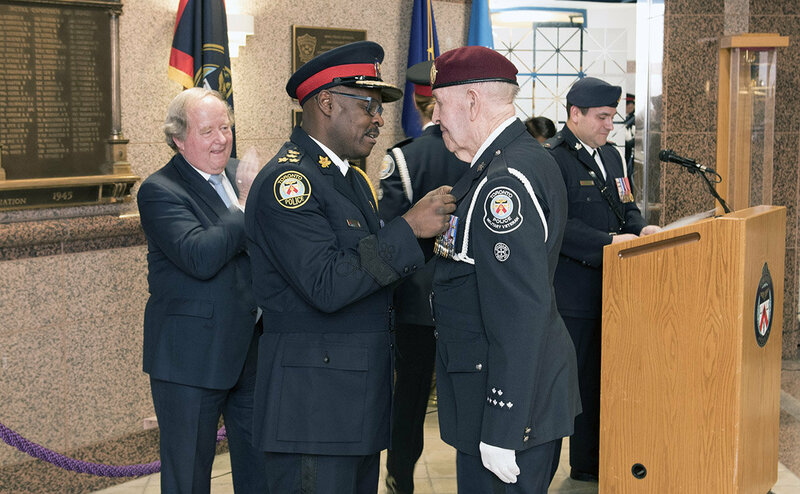 Retired Staff Superintendent and World War II veteran Jack Reid, who -- as a Toronto Police Military Veterans Association (TPMVA) volunteer for over 30 years -- was instrumental in changing the organization’s charter, offering membership to all ranks of the Service who have served domestically or internationally, was presented with the Sovereigns Medal for Volunteers. 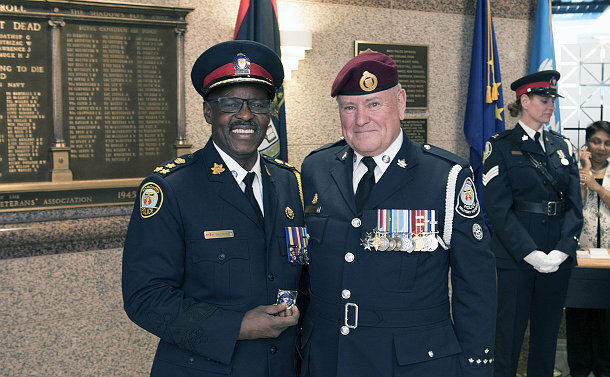 TPS Chief Mark Saunders was made an honourary TPMVA life member and presented with a golf Chief coin. He thanked the members for their commitment and their families for allowing them to serve overseas. 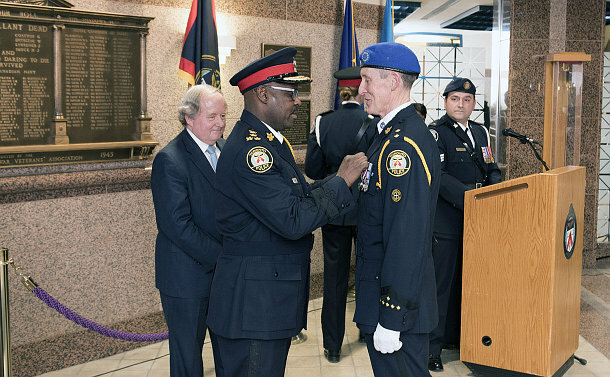 In 1999, the TPS partnered with the RCMP International Police Peace Operations program, deploying the first officer, Sergeant Paul Allen, who served in Bosnia. Since that time, 100 officers have been deployed on peace operations around the world, including East Timor, Kosovo, Jordan, Afghanistan, Haiti, Ukraine and Iraq. The Service’s International Police Peace Operations co-ordinator, John Lo Bianco, said deployed officers bring back a wealth of knowledge and global policing experience they share with their colleagues.